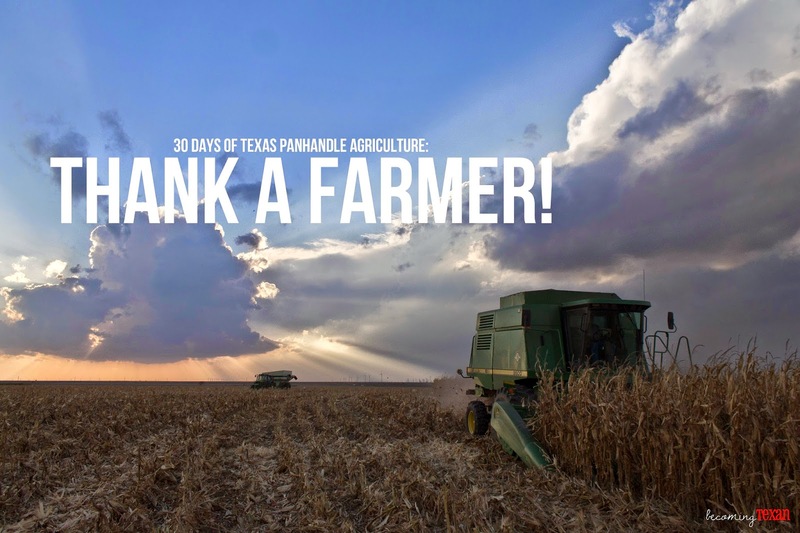 Becoming Texan: Thank a Farmer! It has always struck me as an oddity when we pray before a meal, thank God for the food and those who prepared it, and yet forget to thank Him for those who produced the food. Maybe it is just because I've always been raised around farming, or maybe I'm just hyper-sensitive about giving credit where credit is due. Either way, I ask that tomorrow as you gather with your friends and family for a bountiful meal, remember to thank the farmers and ranchers who produced and raised the food you enjoy. I make this request because of the reason why I celebrate Thanksgiving. I don't celebrate Thanksgiving for the football, the turkey or as the day before Black Friday. I celebrate Thanksgiving to remember how far we've come as a nation since the Pilgrims and Native Americans held the first Thanksgiving. As a nation, most of us don't have to worry about where we will get our next meal because of amazing agricultural innovations and awesome farmers and ranchers. That's a big difference from a bunch of European settlers who didn't know how to raise corn, and that is something I'm very proud of. Thank you to farmers and ranchers everywhere! This is the 23rd post (posted on the 26th day of November) of my 30 Days of Texas Panhandle Agriculture series. To read more, please visit this introduction post. If you have questions or ideas you'd like me to write about concerning Texas Panhandle agriculture, I'd love to hear from you!